This is a little bit late, but considering how it's my birthday weekend I think I can be excused. I had another lazy day on Saturday in which I really could not be bothered doing anything except reading fanfiction after a disastrous baking attempt. I wanted a pavlova for my birthday cake, and I was faced with the issue of my sister-in-law not being able to eat dairy for the time being as my baby nephew still gets a rash whenever she consumes it. I made pavlova out of aquafaba instead of the traditional egg white because I wanted to try making a meringue from the liquid from a can of chickpeas. I'd heard about it a lot over the past year and it sounded awfully interesting. The meringue turned out perfectly as I followed the recipe to a T, but it quickly spread like lava in the oven while baking and I couldn't salvage it. I was incredibly disappointed because that had never happened before with egg-white meringue and I was a qualified pastry chef, damn it! I still haven't figured out why or how it happened, but I felt much like a failure for most of the day. In the end, I went with a storebought pavlova, intending to top half of it with coconut cream. That did not go very well either, as it just would not whip. Needless to say, I had to serve a portion of the pavlova with just fruit. Yesterday, I was at Mum's house for my birthday, which is actually today. Normally we get together on the day of my birthday, but because half the members of my family are busy with work we decided to do it yesterday instead. 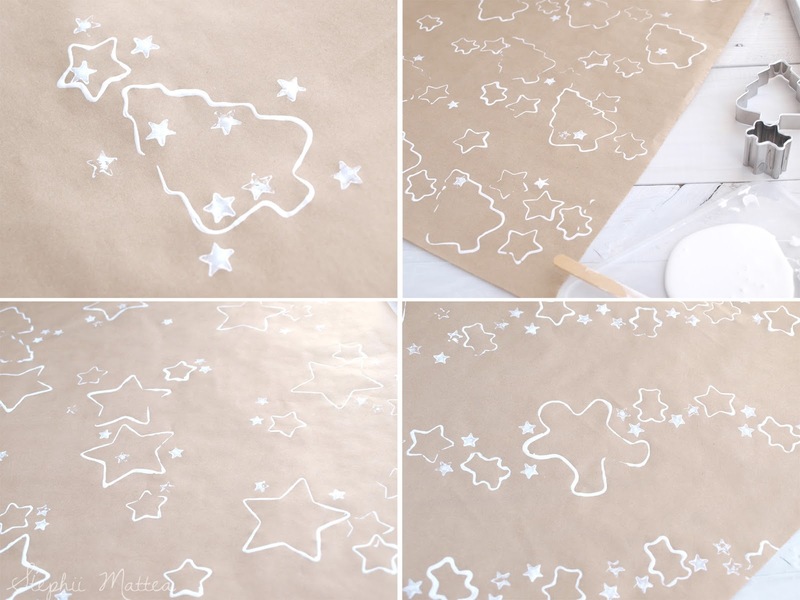 I wanted to show you guys a very simple tutorial on decorating/painting your own wrapping paper. 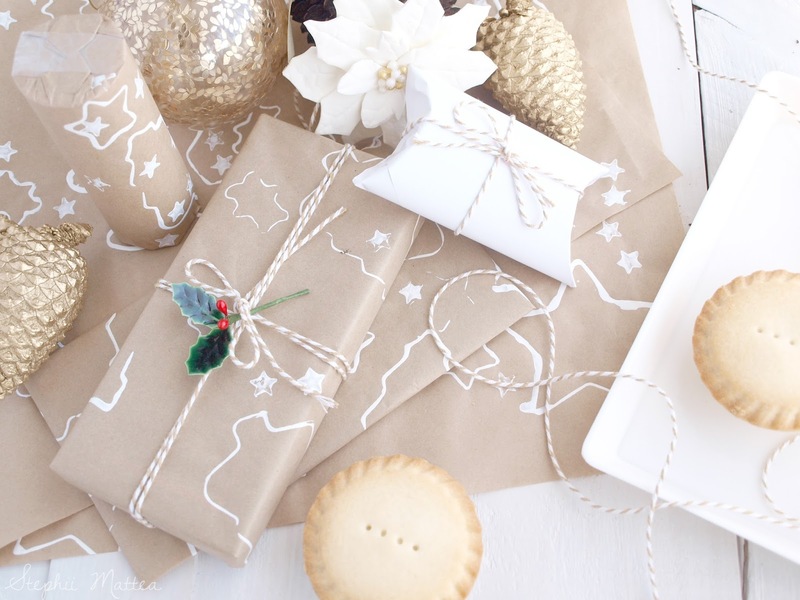 It looks rather classic and chic, and it's pretty cute when grouped together with plain white and brown wrapped gifts, with bakers twine. I may or may not have a thing for bakers twine. Now, before you all chew my head off for using cookie cutters in this project, I have two sets of cutters. One specifically for food, and one just for crafting. I used to make miniature/fake sweets accessories, so I accumulated quite the cutters for said hobby. I deconstructed a star-shaped plunger cutter so I could get a filled star, not just the outline of it. 1. Lay some newspaper on your surface to make cleanup easy, and then cut a section of paper. Flatten it out on the surface, right side up. 2. 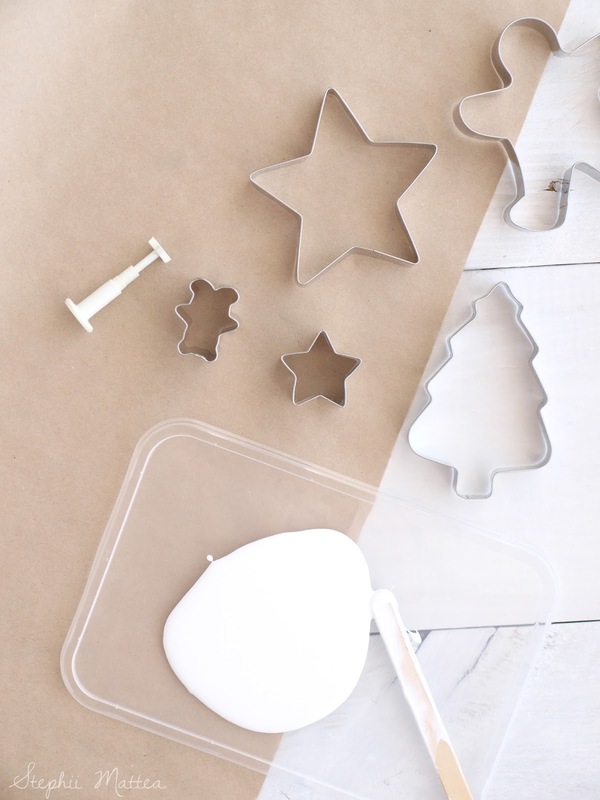 Pour some paint into the plate or lid, and flip the cookie cutters so that you use the blunt side to make your prints. Don't put the whole thing into the paint at once because it tends to create a film of paint across the cutter. Just tap the cutter into the edge of the paint and turn it around as you go along. 3. Press the cutter to the paper, taking care to not knock the paper or cutter, so that the image doesn't get smudged, and repeat. I recommend topping up with the paint after every second or third transfer, or else the image becomes faint or disjointed. 4. If you're using a deconstructed plunger to use the flat piece within it, drag a small amount of paint onto the side so that it is a bit thinner than the main pool. Too much paint on the plunger distorts the edges. 5. Create whatever pattern or style that interests you. I went with a starry theme, a standalone tree with a few stars around it, chains of bears, stars and trees, and a mishmash of everything. 5. Leave the paint to dry for a few hours, and then it is ready to use. Meanwhile, wash the cutters in warm soapy water. So that's pretty much all it takes to make super cute wrapping paper, and it gets done pretty quickly, without any drawing or brushing. 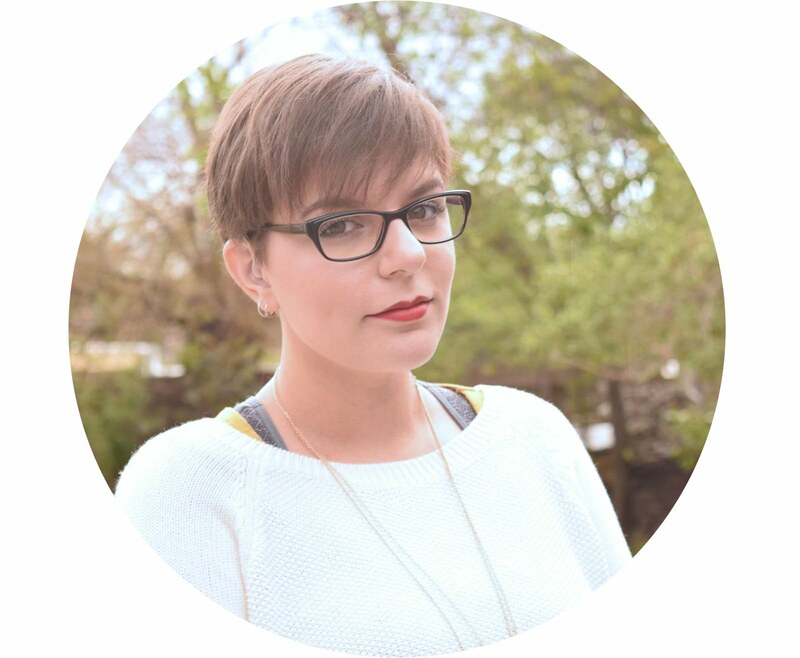 I'm all for quick and easy methods that let me get an entire project done in mere minutes. 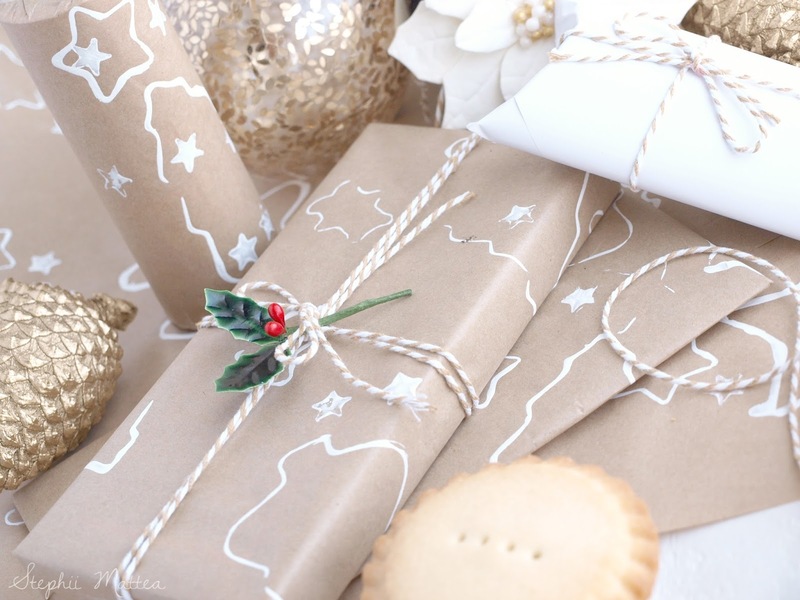 Have you made your own wrapping paper before? How did you do them? Do you have any links?